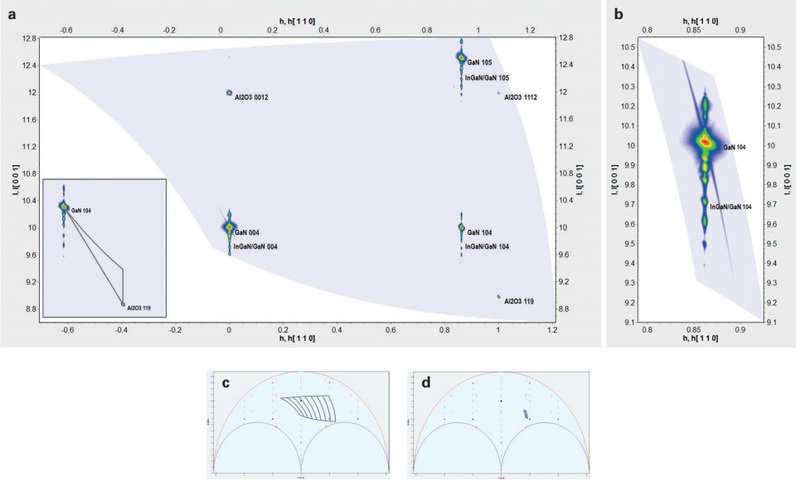 Characterise thin films with large area reciprocal space mapping. With the Bruker EIGER2 R 500K XRD detector you can map large areas in a realistic timeframe, collecting multiple substrate and film reflections and accurate peak intensities. Blue Scientific is the official distributor for Bruker XRD in Norway, Sweden, Denmark, Finland and Iceland. For more information or quotes, please get in touch. Epitaxial films can be difficult to characterise, because of various inter-related structural effects. For example, strain caused by lattice mismatch can cause peak shifts, but these can also be caused by variation in alloy composition. Peak broadening can be a sign of finite crystallite size, mis-orientation between domains, strain relaxation with thickness or all three. While coupled scans and rocking curves provide some of this information, the only way to gain a complete picture is to build a map over reciprocal space. You can also distinguish diffraction peaks from instrumental effects (eg monochromator streaks), avoiding incorrect interpretation of data. To capture a large area of reciprocal space, you need a large detector. 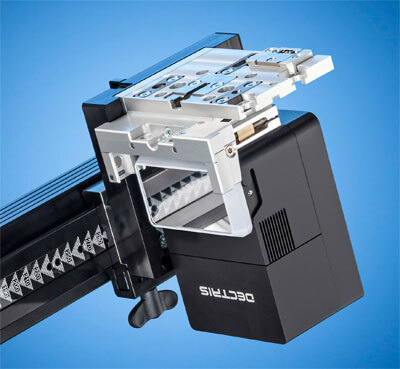 The Bruker EIGER2 R 500K is capable of covering a much wider region than would usually be feasible. The example below consists of 2,061,030 data points, collected by the EIGER 2 in just half an hour. With a standard 0D detector taking 1 second per point, this map would take 572 hrs to collect with a 0D detector. Even a 1D detector would take 3 hours, so the EIGER2 reduces this time dramatically, making RSM a much more practical option. RSM collected in 0.5 hrs with the EIGER2 (click to enlarge). a) Large-area map of a blue LED taken at close sample-to-detector distance (140 mm). Multiple substrate and film reflections are visible. The relaxation triangle shows fully relaxed GaN. b) Detailed RSM of GaN 104 acquired with a longer detector distance (470 mm). c & d) Reciprocal space coverage at the close and far detector distances. 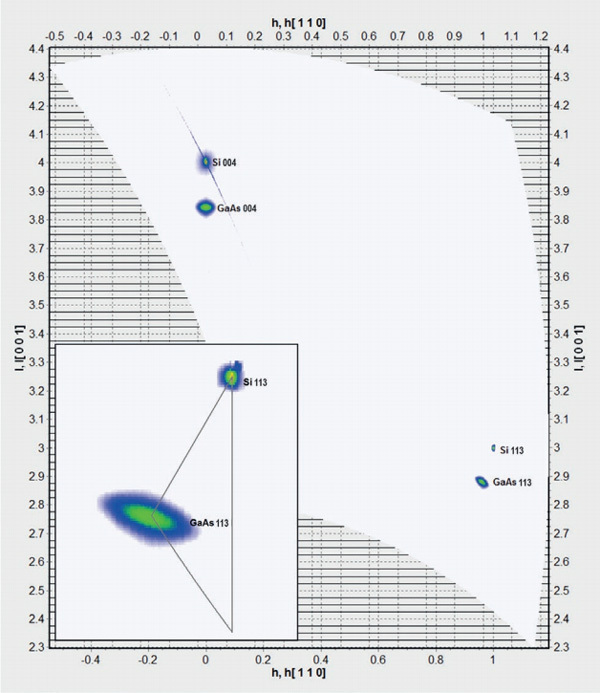 The example above is a map of a functional blue LED, taken using the Bruker D8 Discover diffractometer and EIGER2. It consists of a complex quantum well structure with a large mismatch between the substrate and film structure. At a close detector distance, multiple substrate and film reflections are observed, making it possible to measure the relaxation of the initial GaN layer relative to the substrate. Pushing the distance back then provided higher resolution, for bimproved peak separation. In the example below, large area reciprocal space maps of two single-layer films were collected with both on-axis and off-axis reflections, to determine the degree of relaxation. Collecting multiple reflections in the same map enables you to easily recognise strain, composition and tilt effects, without errors from variations in the sample alignment. Large-area RSM of a relaxed GaAs film on Si. The inset is a close-up of GaAs 113; the relaxation triangle shows fully relaxed film. Large-area RSM of a strained Si1-xGex film on Si. Inset shows zoomed-in image of Si1-xGex 113 with relaxation triangle showing fully strained film. With the Bruker EIGER2 R 500K XRD detector you can cover a wide region of reciprocal space in a realistic timeframe. This means you can fully characterise complex device structures, with multiple substrate and film reflections, even with lattice mismatch. By changing the sample-to-detector distance you can balance coverage and resolution to resolve narrowly-spaced film peaks. Capturing on-axis and off-axis reflections simultaneously makes it possible to distinguish between effects that cause peak shifts and broadening, including layer tilt, relaxation, composition and finite domain size. You can also perform multiple analyses on each data set, for the best data possible. 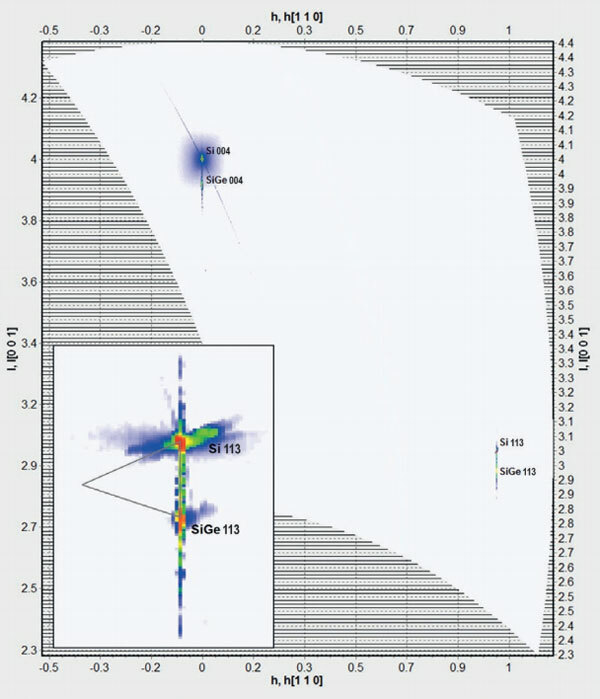 In the example above, Si1-xGex Si1-xGex 113 was used to determine composition and strain, while thickness was measured more accurately from the Si1-xGex x 004 fringes with higher specular intensity. In addition to this, the high dynamic range of the EIGER2 records intensities accurately, so sections of the map can be extracted for further modelling and fitting.